We saw these 2 prints just 10 minutes walk from the centre of town. The Tiger print was on the town side of the river!! Yikes. The tiger is a fully grown male. 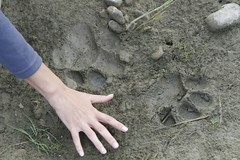 We saw another very fresh tiger print on the path we were walking on later the next day. 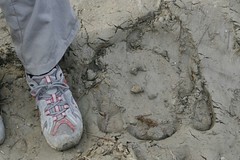 The tiger print was still damp and on top of a trainer shoe track.